In a few weeks our own preschoolers will begin a new preschool year. 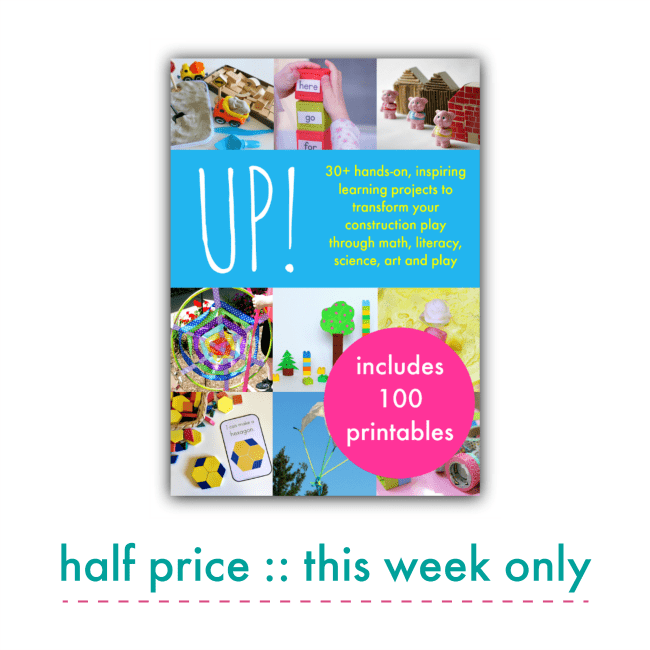 We are pleased to partner with Nurture Store UK to offer YOU all three of our co-authored eBooks: UP, Make Your Mark, and ABC’s and 123’s for 50% off THIS WEEK ONLY! Playful learning with engineering, ABC’s, and numbers in preschool has never been easier with full-color photos and easy set-up activities to spark curiosity, imagination, and wonder about the world. The special back-to-school 50% off sale begins TODAY (August 4th) and ends Saturday, August 11th (at midnight). 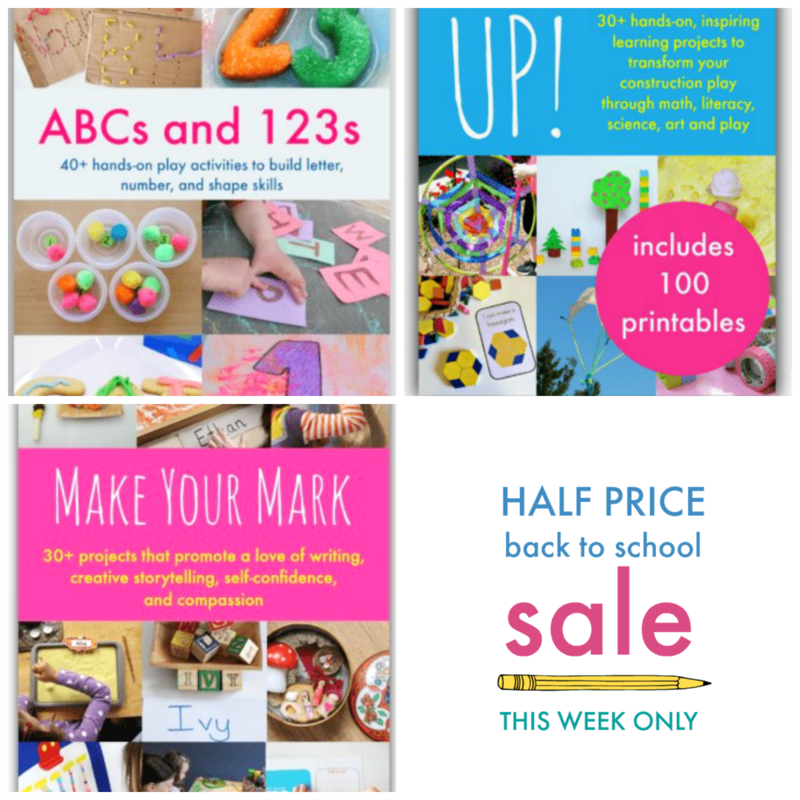 Don’t miss the opportunity to get ALL playful learning eBooks during the sale to add to resources in your classroom, childcare, or for use in your home preschool. Do you wonder how to help your preschoolers learn about ABC’s and 123’s? The ABC’s and 123’s eBook can help with plenty of suggestions for hands-on playful learning at home, in childcare, or in the preschool classroom. 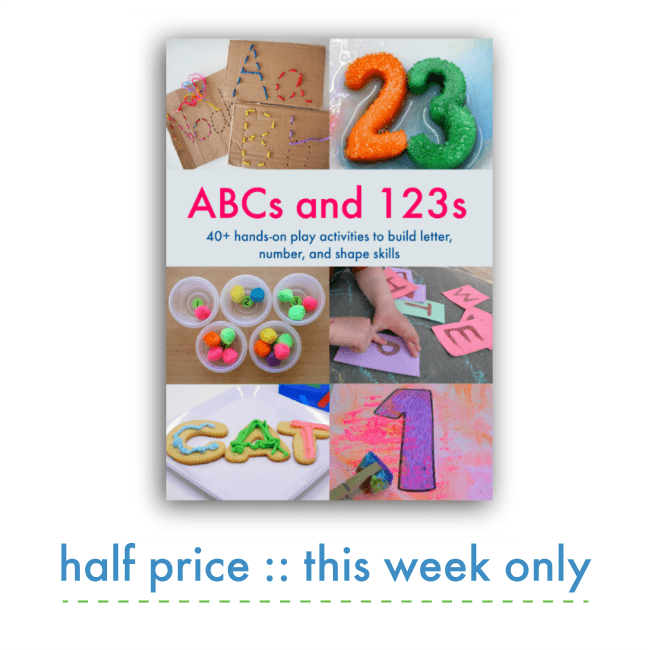 Purchase the ABC’s and 123’s for just $7.49 through August 11th. :: 30+ hands-on projects that invite your child to explore all things Up! :: guidance on how to support your child’s interests, and how to help them expand their exploration and learning across the curriculum. This book is all about hands-on, project-based, passion-led learning. :: material lists, step-by-step instructions, and full colour photographs of every activity. :: 100 printable pages including shape challenge cards, build challenge cards, and a set of world architecture prints. Purchase UP! for just $7.49 through August 11th. :: Activities that support your child in understanding more about themselves and others, through interviews, self-portraits, collaborative art, and collaborative projects. :: And finally we’ll help your child see that everyone can make their mark on their community and the environment. We show you how to extend the idea of our self out into the world, and consider how we are part of a community. Withaccessible and achievable projects, we’ll inspire your child to make their mark through environmental citizenship and acts of kindness. :: Also included: six sets of printables for you to download, including pattern writing cards, a ‘my favorite things’ photo book, ‘all about me’ interview sheets, pretend play post office accessories, and comic book and gracious giving printables. 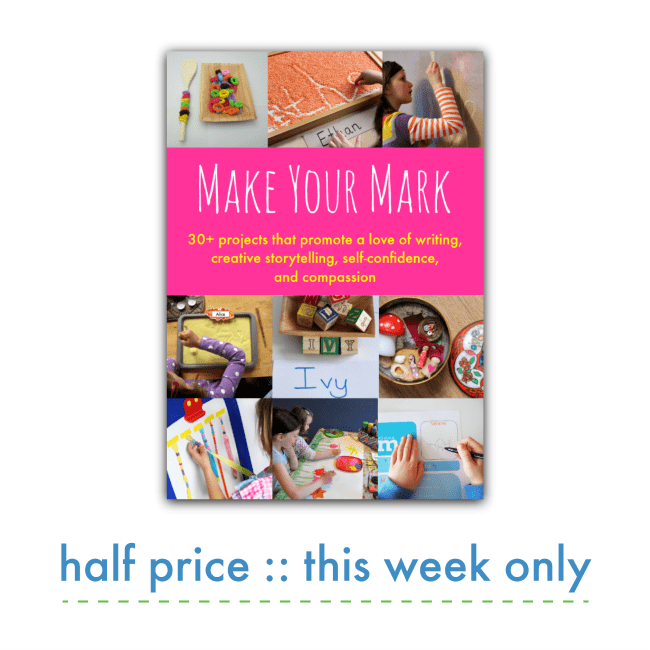 Purchase Make Your Mark for just $7.49 through August 11th. With the exception of the United Kingdom, the items listed on this page are not available for purchase in the EU. ALL eBooks are published and sold by Cathy James at NurtureStore.co.uk. Please direct any customer service queries regarding purchases to support @nurturestore.co.uk or refer to the NurtureStore FAQ. All eBooks are protected under copyright @Nurturestore.uk.